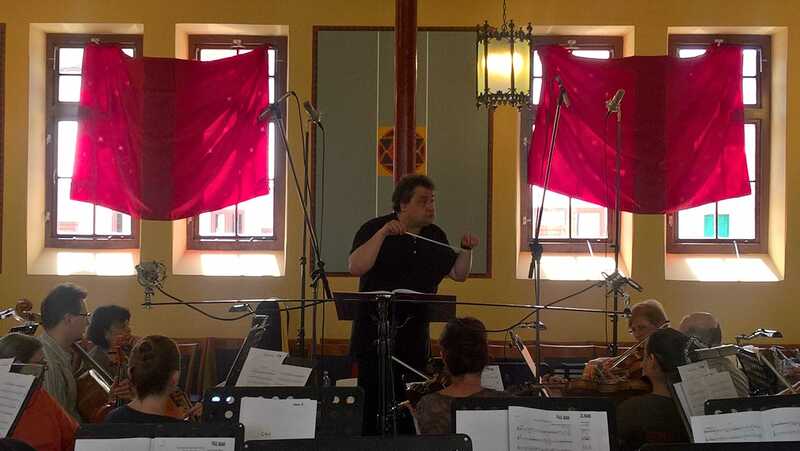 Paul Mann is a regular guest-conductor with many orchestras throughout Europe, the USA, Australia, and the Far East. Those with which he has worked include the BBC Orchestras, the Orquesta Ciudad de Barcelona, Bergen Philharmonic, Orquesta Sinfónica de Bilbao, Orchestre de Bretagne Britten Sinfonia, City of Birmingham Symphony, Copenhagen Philharmonic, Flemish Radio, Orquesta Ciudad de Granada, Hallé, Lahti Symphony, Luxembourg Philharmonic, Netherlands Radio Philharmonic, St Petersburg Philharmonic, Royal Scottish National, Real Orquesta Sinfónica de Sevilla, RAI Torino and Orchestra dell’Arena di Verona, among many others. His debut with the Queensland Orchestra in 2003 resulted in regular re-invitations to Australia, with the Adelaide Symphony, Melbourne Symphony, Tasmanian Symphony and West Australian Symphony Orchestras, as well as the Auckland Philharmonia in New Zealand, and the Malaysian Philharmonic. His work as chief conductor of the Odense Symphony Orchestra in Denmark achieved considerable critical success, particularly in the symphonies of Beethoven, Elgar, Mahler, Schumann and Shostakovich, and with whom he also made numerous recordings of a wide range of repertoire, for such labels as Bridge, DaCapo and EMI. He first came to international attention as first prizewinner in the 1998 Donatella Flick Conducting Competition, as a result of which he was also appointed assistant conductor of the London Symphony Orchestra. He made his LSO debut shortly afterwards, and subsequently collaborated regularly with the Orchestra both in the concert hall and recording studio. Special projects with the LSO included the Duke Ellington Centenary Concert at the Barbican Hall with Wynton Marsalis, and a famous collaboration with the legendary rock group Deep Purple in two widely acclaimed performances of Jon Lord’s Concerto for Group and Orchestra at the Royal Albert Hall, the live DVD and CD of which remain international bestsellers. Among his most recent recordings is the first-ever studio recording of Lord’s Concerto, with the Royal Liverpool Philharmonic Orchestra, in collaboration with Jon Lord himself and a star-studded cast of soloists, and the live recording of Celebrating Jon Lord, a special concert which took place at the Royal Albert Hall in April 2014 with an all-star cast paying tribute to the late composer. This is his fourth recording for Toccata Classics. The first featured the orchestral music of Leif Solberg (TOCC0260) and the second and third (TOCC0262 and 0263) presented the first volumes in his three-disc survey of the complete orchestral music of the Scottish Romantic Charles O’Brien (1882–1968). His recordings of the complete orchestral music of Henry Cotter Nixon (1842–1907), also with the Kodály Philharmonic Orchestra, are in preparation (TOCC 0372, 0373 and 0374).